Every morning my daughter would watch me, her little face peering up as I’d swipe on a little powder, some blush, maybe a bit of mascara or lip gloss as I dressed for work. “I do,” she’d say, and I’d hand her an unused brush, let her pretend to apply makeup. One Saturday morning when I wasn’t looking, she wandered into my bathroom while I was in the kitchen. Ten minutes later, she emerged beaming ear to ear. 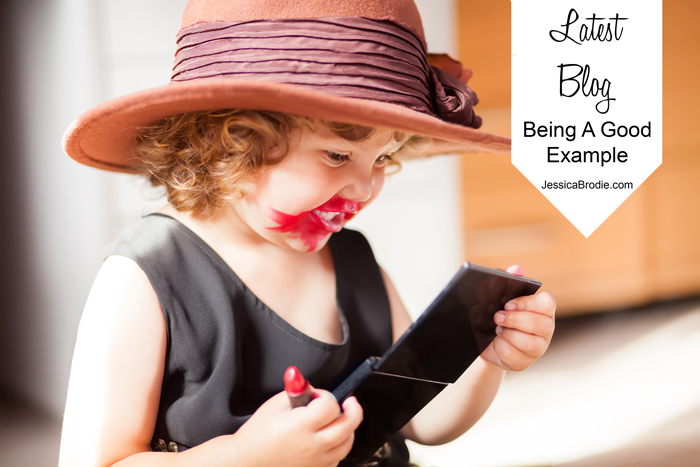 “I’m like Mommy!” she said proudly, and I turned to see my four-year-old with shimmery eye shadow from lashes to brows, unnaturally rosy cheeks, and the most vivid shade of red lipstick slashed across her mouth like she’d turned into a rabid dog. She’d watched me put on makeup, and now it was her turn to try. One of the biggest and quickest lessons we learn as parents is how powerful our example can be for our children. They see what we do and want to do the same. They hear the words from our lips and become human parrots, repeating our phrases in their own childish voices. They soak it all up like little sponges. Jesus’s words recorded in the Gospel of John remind me of this. After performing miracles on the Sabbath, Jesus faced much criticism from Jewish leaders, who felt he was disobeying and disrespecting God’s law by doing work on the day of rest. “Jesus responded to the Jewish leaders, ‘I assure you that the Son can’t do anything by himself except what he sees the Father doing. Whatever the Father does, the Son does likewise’” (John 5:19 CEB). As God’s son, Jesus knew his role was to lead others to God, to point the way to eternal life in heaven. His ways are to become our ways, and in him we have salvation. But here’s the thing: I don’t want my daughter doing everything I, her earthly parent, does. Even as hard as I try, I know I’m not always the best example—I make many mistakes. I hope by the time she grows up she won’t have the same struggles I had as a young woman with patience and pride. I’ve worked hard to overcome there, but I’m definitely a work in progress. But we have a perfect role model in Jesus, for God’s son does his father’s will. I pray my children, and others watching my example, will see Jesus in me and make his beautiful, glorious light of heaven their example. Who needs “I’m like Mommy”? Instead, let’s strive to be more like Jesus.